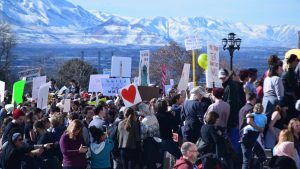 SALT LAKE CITY, Utah, Feb. 4, 2017, (Gephardt Daily) — An estimated crowd of 5,000 people marched on Utah’s Capitol Hill Saturday, voicing opposition to President Donald Trump’s executive orders curtailing travel from seven Muslim-dominated countries in the Middle East and Africa and temporarily banning admission of U.S.-bound refugees. 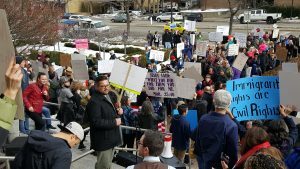 The rally — promoted on social media by a group called Utah March For Refugees — started at the Wallace F. Bennett Federal Building before heading up State Street to the Utah State Capitol. Along the way, they were joined by another group — Mormons for Muslims — which also promoted the rally on social media. At times, the line of protesters stretched for several city blocks. 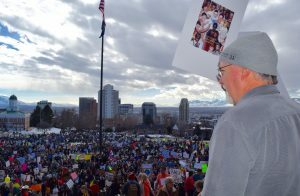 A Utah Highway Patrol trooper surveying the demonstration from the top of the statehouse stairs told Gephardt Daily that the crowd size rivaled that of the Utah Women’s March, which took place two weeks ago. 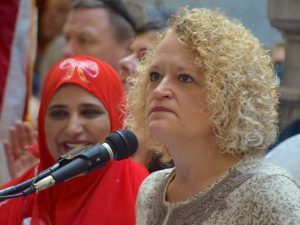 Community activist Kate Kelly — one of the organizers of the Utah Women’s March on Washington, D.C., said she was heartened by the size of the crowd. Salt Lake City residents Jeff Colder and Lianna Lopez echoed Kelly’s sentiments. They told Gephardt Daily the respectful tone of the demonstrations would be key to their success. “It’s a beautiful thing. It’s been really amazing — the people, all the kids here, families of all colors that are supporting this. It’s awesome. Especially for Salt Lake City. I’m from California where you might expect this, but here — it’s blowing my mind just a little bit. It’s making me excited. 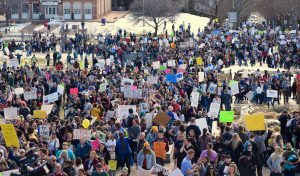 While its size paled in comparison to the Salt Lake City protest, an estimated 300 marchers took the streets of Ogden Saturday to take Mr. Trump to task. 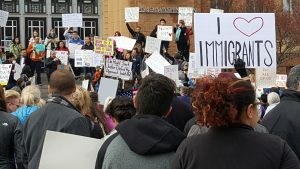 “I am here because this is just so wrong to try and ban people,” said North Ogden resident, Patty Halling, “particularly from countries that, well, mostly because of their religion. But it became very obvious that it was from countries that Donald Trump doesn’t have any businesses in. And the countries where we have proved that terrorists have attacked Americans and he has businesses there was no ban. Navy veteran Collin Chandler also hit the street Saturday in Ogden Saturday. He said taking part in a smaller town protest was as important as any big city march. “Everybody needs to know there’s resistance to what’s going on everywhere,” Chandler explained. “There’s support for people who are being oppressed and discriminated against and marginalized everywhere. I wish Utah would be this driven, and fired up to petition for our homeless people, and help get them off the streets and into homes. We have too many low and no income people in our state as it is. Where are we going to get funding to take in more people who have no homes?? Have any of these people thought about how we will afford more of these refugees? Thank You you are right…Why is no one worried about the homeless they have in Utah…Down here on the border …It is the Muslims coming thur not the people from Mexico…They need to be checked let’s do it right….Why don’t all these people sponsor some, put them in there homes.?? ?.